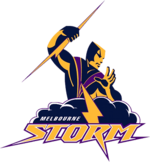 The Melbourne Storm is an Australian professional rugby league club based in the city of Melbourne. The Storm have played in the last four National Rugby League (NRL) grand finals, making them one of the league's top teams. They are also considered as the first fully professional rugby league team based in the Australian rules football-dominated state of Victoria. In October 2009, they were ranked the most popular sports team in Melbourne by a national Roy Morgan Poll. The club won the minor premiership three times in a row from 2006-2008 and contested each grand final from 2006 to 2009, winning in 2007 and 2009, although these titles were later stripped for salary cap breaches. They were named the NRL Team of the Decade for the 2000s. Their coach, Craig Bellamy, is the incumbent New South Wales State of Origin coach. From their inception and until the end of 2009, the Storm played the majority of home games at Olympic Park Stadium. From 2010 they moved into their new home at AAMI Park, the first game at the new venue was against the Brisbane Broncos. Originally a Super League initiative and one of six NRL teams which are privately owned, the Melbourne club is currently 100% owned and operated by News Limited.